Health Costs > How Much Does a Mole Biopsy Cost? How Much Does a Mole Biopsy Cost? Moles are actually defined as discolored spots on the skin and can appear in different colors anywhere on the body. Moles are usually different shades of brown or black and may be raised or level with the skin. Generally, moles are considered harmless; however, there are some types that can actually be melanoma, which is a type of skin cancer that can be serious if untreated. If a mole is cancerous, it is referred to as malignant. Some warning signs of malignancy can include irritation, rough borders, asymmetry, and bleeding. A mole that becomes cancerous is also likely to change in shape, size, and color. When any of these signs occur, medical attention must be considered immediately. If this were the case, a mole biopsy is usually conducted, which involves a microscopic analysis of cell specimens from a piece of tissue extracted from the mole. This biopsy needs to be done in a doctor’s office or lab. 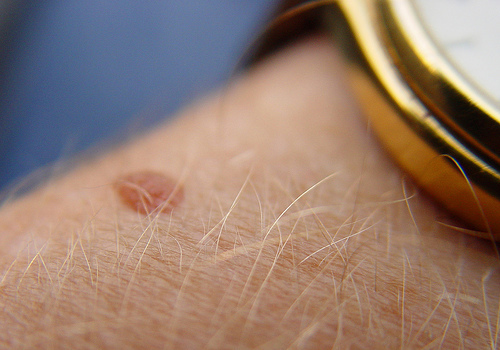 Early detection through a biopsy is crucial in treating melanoma. A mole biopsy, on average, can cost $80 to $400 without insurance. The price will depend on your doctor’s office and the lab they use. If you do have health insurance, check with your policy to see what they are going to cover. If you do not have health insurance, eHealthInsurance.com can help you find the best plan. According to Realself.com, the cost of a mole removal and biopsy, according to the members, could about $350 on average. If a path run is required, this would add about $75 more. MDSave.com says the national average for a skin biopsy is $536. The procedure of a mole biopsy will begin in the same way as having your blood drawn. The area will be cleaned, dried, and then a small amount of a local anesthetic will be administered. After about 10 seconds of allowing the anesthetic to take effect, the doctor will remove the skin using whichever type of biopsy they think is best. During an excision biopsy, which is the most commonly done procedure, the mole will be cut out from beneath the skin. It will then be closed using stitches or may be cauterized. If it is shown that the mole is entangled with the blood vessels, a laser biopsy will usually be performed. This is the same as an excision except that no scalpel is used. A punch biopsy can also be performed by doing an excision, but this process will remove less of the skin surrounding the mole. This is most often performed on larger moles. Shave biopsies are used for moles that are raised from the skin. This type of biopsy is just as it sounds; the top layer of the mole is shaved off and tested. The skin specimen that has been removed is then sent to a dermatopathologist for analysis to see whether it is benign or malignant. With large moles, usually only a small portion using “punch biopsy” is performed, while small moles and about one to two mm of surrounding tissue are totally excised. Oral medications, including pain relievers and antibiotics, are usually prescribed after the procedure. Some doctors may require a path run which entails an additional cost of around $75. If the scar does not heal as expected, a deep massage or steroid injections could be necessary to help it heal. Generally, doctors prefer to remove the whole lesion to make a conclusive diagnosis of melanoma, the extent to which it has penetrated, and its characteristics. Even if the mole is not melanoma, there is no harm done in removing it. If moles are situated in a sensitive area on the face, doctors may perform a deep shave biopsy. For smaller lesions, a punch biopsy is often performed. All of these procedures are relatively painless because of the administration of a local anesthetic. Just a few days are required for recovery to resume normal activities. If you do not want to undergo a biopsy until it is absolutely necessary, you can ask your doctor about having a dermoscopy. During this test, the mole that is in question is looked at using special equipment which acts as a powerful microscope. Some doctors offer removal and biopsy packages for discounted prices if you meet certain financial obligations or do not have health insurance. If you have more than one mole, try to get as many removed as you can. The more you can get done at a time, the more you are going to be able to save per mole. If you can’t afford the procedure, consider looking for a free or low-cost clinic in your area that can help cover the costs.